The purpose of training should be to make you function better, not break you down, writes personal trainer Sarah Cremen. WHEN YOU HAVE a specific goal in mind — be it to get fitter, faster, stronger or leaner — the last thing you want is injury, stiffness or pain to stop you dead in your tracks. The purpose of training should be to make you function better, not break you down. Smart, effective training will prepare your body for the physical demands of life, but unfortunately, due to the unpredictable nature of life, sport and the human body in general, injuries are never completely avoidable — but there are ways of reducing the risk of occurrence. Prevention is better than cure and good mobility, balanced programming and smart progressions can go a long way to helping you stay strong, healthy, pain free and moving ever closer to your goals. As far as range of movement is concerned, if you don’t use it, you lose it. Pretty much every new client I meet has an injury history and as a result, compensations that have become habitual patterns influence their ability to move and exercise safely and effectively. Health and functionality is built on a foundation of strength and mobility, but can be far too easily lost through inactivity. Mobility is a sort of umbrella term that encompasses soft tissue work, flexibility and joint mobility but specifically refers to the ability to move a limb or joint through full range of movement with control. The more mobile you are, the more able you will be to easily and freely execute desired tasks, but it is something that requires constant attention. Most frequently, restrictions occur in the shoulders, thoracic spine, hips and ankles, but if you are unsure, take the time to seek out an experienced professional who can assess and guide you in the right direction. While a lot can be said for exercising moderation and caution with training, you also need to actually train and work hard. Increasing your overall movement capacity through mobility work is great, but ideally it should supplement a solid, balanced strength training regime. Physiological changes occur in bones, muscles and connective tissues when dynamic loads are placed on the joints during resistance training, so include carries, hip hinges, squat variations, pulling, pushing, rotation and anti-rotation exercises to build a body that is healthy, strong, functional and powerful. While it may look impressive, the presence of a six pack has very little correlation to how strong your core actually is or how well it functions. Beyond the six pack is a network of deep stabilisation muscles; the epicentre from which all movement and force transfer is initiated. Core control is essential to stability, force production, injury prevention and thus, athletic performance. While training compound strength exercises like squats and deadlifts will give you incidental benefits, if you’re not specifically training your core in different planes of movement, you may be doing your body a disservice. Programming exercises or “anti” exercises, alongside breathing techniques and re-positioning activities, is an important part of understanding optimal breathing patterns, addressing imbalances and alignment issues and ultimately remaining injury free. Check out a previous article I wrote on this here ​and here. Training your posterior chain needs to be a priority if you want to increase your strength and athleticism and stay significantly less injury prone. The most influential group of muscles when it comes to strength and power, they stabilise you with an anterior load or direct downward pressure, preventing you from falling forward and drive you upwards when lifting heavy loads. Sedentary lifestyles that subject us to excessive forward flexion have ultimately resulted in suboptimal muscular activation patterns in the posterior chain — ever heard of “glute amnesia”? Thanks to endless hours of sitting, our glute max, one of the most powerful hip extensors in the human body, is more often than not in holiday mode, essentially taking a break from performing its function and allowing synergistic or “helper” muscles pick up the slack. The result? You end up with dysfunctional movement patterning, positioning and at a mechanical disadvantage that increases your risk of injury. While the posterior chain includes some of the biggest and most powerful muscles in the body, it’s often unintentionally neglected as it lacks the aesthetic appeal of the “mirror muscles”. While I’m not suggesting you abandon all anterior exercises (remember…balanced programming), aiming for a minimum of 2:1 ratio of pulling (think hip hinges and row variations) : pushing (think bench press, overhead pressing) exercises will benefit your body in the long run. 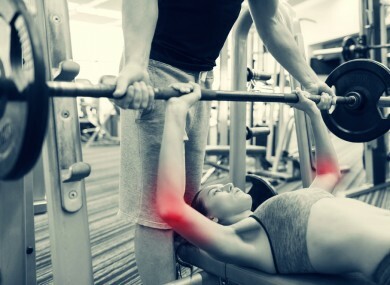 Email “3 tips to aid injury prevention when you're in the gym”. Feedback on “3 tips to aid injury prevention when you're in the gym”.